Fujairah police dispelled rumours that had gone viral on social media, about a "Boeing 747 passenger jet making an emergency landing on the corniche of the emirate"
Fujairah: Police here on Monday night have dispelled rumours going viral on social media stating that a Boeing 747 passenger has made an "emergency landing" on the emirate's corniche. Colonel Saeed Al Hassani, Director of Media and Public Relation Department at Fujairah Police , told Gulf News that the jumbo jet is already out of service and only the main fuselage — without wings — was transported. The decommisioned aircraft was being moved by trucks from Fujairah International Airport to the sea port in order to be shipped to a "neighbouring Gulf country". On Monday evening, videos and pictures showing an airplane on Fujairah Corniche and people took to the social media to discuss the incident. Many were asking about the aircraft piggy-backing on huge trucks, while some had stated the aircraft had landed on Fujairah's shore. Police patrols secured the shift of the wingless airframe which took less than 20 minutes, the official said. 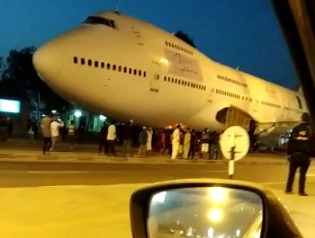 But the sight of jumbo jet being moved on Fujairah's road towards the pier became a spectacle, with some people taking snaps and sharing videos online. The police have urged residents to avoid spreading false information as it impacts the safety and security of the country. Fujairah Police warned those who spread fake news will be referred to public prosecution for further action. Bahrain earlier announced it was building the world's largest underwater theme park with a submerged 747. It was not immediately clear if the same decommissioned aircraft would be used for the dive site. On Monday evening, videos and pictures showing an airplane on Fujairah Corniche and people took to the social media to discuss the incident. Many were asking about the jumbo being moved to the sea port, while some had stated the aircraft had landed on Fujairah's shore.